In a new analysis of climate models, researchers from the University of Pennslyvania, Spain's Institute of Marine Sciences and Johns Hopkins University reveal the significant global effects that these seemingly anomalous polynyas can have. Their findings indicate that heat escaping from the ocean through these openings impacts sea and atmospheric temperatures and wind patterns around the globe and even rainfall around the tropics. Though this process is part of a natural pattern of climate variability, it has implications for how the global climate will respond to future anthropogenic warming. "This small, isolated opening in the sea ice in the Southern Ocean can have significant, large-scale climate implications," said Irina Marinov, a study author and assistant professor in Penn's Department of Earth and Enviromental Science in the School of Arts & Sciences. "Climate models suggest that, in years and decades with a large polynya, the entire atmosphere warms globally, and we see changes in the winds in the Southern Hemisphere and a southward shift in the equatorial rain belt. This is attributable to the polynya." The study appears in the Journal of Climate. Marinov coauthored the work with Anna Cabre, a former postdoc in Marinov's lab and now an oceanographer with the Institue of Marine Sciences in Barcelona, and Anand Gnanadesikan, a professor in the Department of Earth and Planetary Science at Johns Hopkins. winter. Polynyas occur when warm subsurface waters of North Atlantic and equatorial origin mix locally with cold surface waters, a process known as open-ocean convection. Their model indicated that polynyas and accompanying open-ocean convection occur roughly every 75 years. When they occur, the researchers observed, they act as a release valve for the ocean's heat. Not only does the immediate area warm, but there are also increases in overall sea-surface and atmospheric temperatures of the entire Southern Hemisphere and, to a lesser extent, the Northern Hemisphere, as well. "We are seeing a decrease in what we call the Southern Hemisphere westerlies and changes in trade winds," Marinov said. "And these winds affect storms, precipitation and clouds." "This affects water resources in, for example, Indonesia, South America and sub-Saharan Africa," said Marinov. "We have a natural variation in climate that may be, among other effects, impacting agricultural production in heavily populated regions of the world." "We're also urging people to keep a close eye on the satellites to look for other polynyas, this year and going forward," Marinov said. Earlier research by Marinov's group and collaborators suggested that, under climate change, polynyas may become less frequent. As sea ice melts it freshens the top layer of the sea surface, making it lighter and less likely to mix with the heavier bottom waters. Marinov notes that the fact that no significant polynyas opened up from the mid-1970s until last year may have contributed to the so-called "climate hiatus" in the late 1990s and early 2000s, when global average surface temperatures appeared to stall in their otherwise persistent upward climb. "During this hiatus period abnormal amounts of heat were stored in the subsurface ocean waters" Marinov said. "Most research has attributed this hiatus to a prolonged La Niña period, resulting in a storage of heat in the low-latitude Pacific. 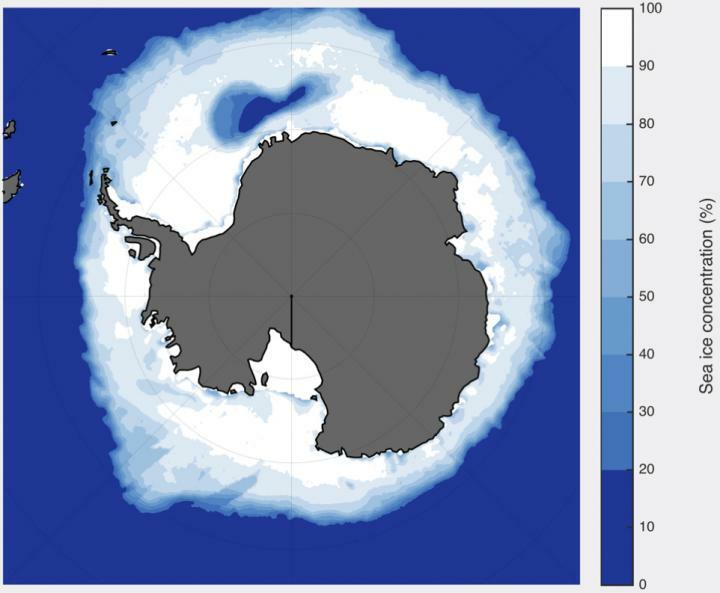 But I think that a lack of a Weddell Sea polynya also contributed, storing more heat in the Southern Ocean and preventing the additional release of heat to the atmosphere." "This investigating into polynyas and Southern Ocean convection turned out to be a very important and interesting story for the global climate that we think a lot of people will be studying in the next decade," Marinov said.